Original Thai Tea Mix from Thailand. 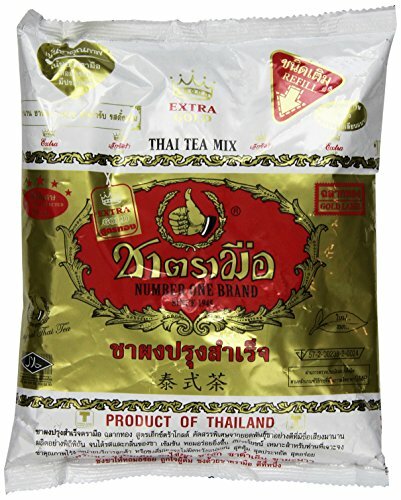 This Number One Brand Thai Tea mix is used for making delicious Thai Iced Tea also known as "Cha Yen" since 1945. It is also a popular bubble (boba) tea flavor. Please follow instructions on back of package for optimal flavor and most consistent results. Serving Suggestions Ice Tea: Add 2 teaspoons of the Thai Tea Mix to 1 cup of boiling water. Drain out Tea Mix with a strainer. Add 2-3 teaspoons of sugar or to liking. Stir well and serve with ice *Add a slice of lemon for lemon Ice Tea** Ice Tea with Milk: Add 2 teaspoons of the Thai Tea Mix to 1 cup of boiling water. Drain out Tea Mix with a strainer. Add 2-3 teaspoons of sugar and 1-2 teaspoons of condensed milk or to liking. Stir well and serve with ice. If you have any questions about this product by Foodkoncept, contact us by completing and submitting the form below. If you are looking for a specif part number, please include it with your message. Premium Thai Iced Tea – 13oz – NEW to Amazon!